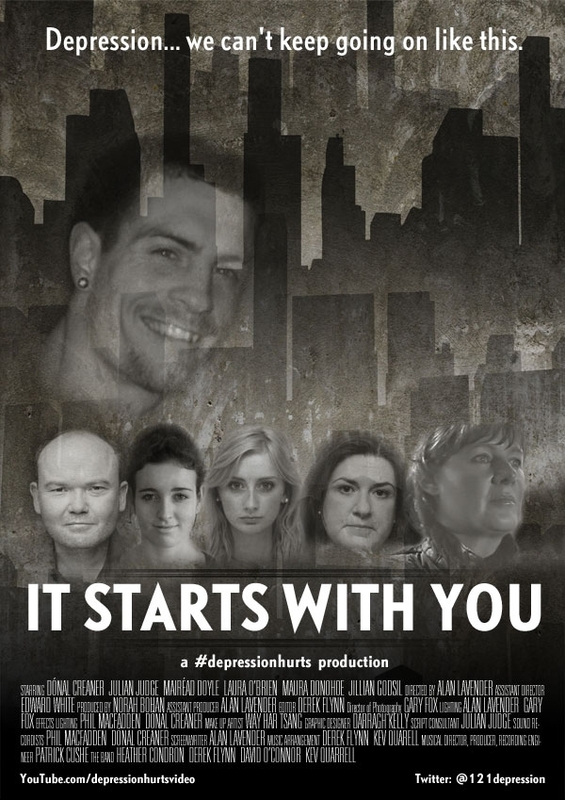 It’s DEPRESSION AWARENESS WEEK so what better time to welcome the launch of an important new web site in Ireland by #depressionhurts Founders Norah Bohan & Alan Lavender, also respectively Producer and Director of the short film ‘It starts with You’ which examines the issues of depression & suicide and the shame and stigma surrounding them. The project and film was made with the support of an army of volunteers from social media network twitter, who together with Bohan and Lavender helped co-ordinate Ireland’s first 24/7 Twitter helpline for depression and suicide, which ran for the nine days of Christmas and New Year 2011. The new website can be accessed at www.depressionhurtsireland.com and it provides a wealth of comprehensive information, useful links and valuable support to users, including real life stories and experiences of those affected by the illness. Specialist sections exist with content for Employees, Employers and Trades Unions to support them in the treatment of Mental Health within the workplace, an area where stigma is seen to be a major problem. – To launch downloadable Helpful Hints with its wallet sized information card, for all to carry, containing advice and emergency contacts. In addition, #depressionhurts launches an education programme next month, initially for schools but also available for colleges, university, other groups. At a time when mental health, ranks high on the agenda in this and other countries, the project and website has astonishingly been created and established with NO BUDGET or FINANCIAL SUPPORT, its success comes from the awe inspiring, passionate determination of Bohan and Lavender that this important issue needs to be addressed and the goodwill of the supporters they have built on and offline. Depression is an ILLNESS, which affects 1 in 4 of us, perhaps you or the people you love and it’s the only illness treated with shame & stigma. #depressionhurts aims to get people talking and understanding depression & suicide to break down the negativity and stigma surrounding both. To date the video, which can be seen on the website has had over 5,000 views and it’s hoped the newly launched website will be equally successful in creating positive change.